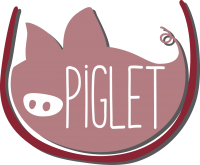 Piglet was a plan hatched by Enrico Fantasia and Thibaud Harang over many glasses of wines and plates of good food. The wine list is a carefully selected mess where natural, biodynamic and organic wines cohabit with the most classic European appellations, and where our two great passions are featured prominently: magnums and old vintages. As with the wine list, the ingredients are sourced wherever possible from small artisan producers. "Piglet is not going to win any prizes in the interior design category at the next restaurant awards... It's a little bit chaotic and untogether, but it feels authentic"
Our Upstairs gallery area has room for parties of 24. It can also be hired as a cosy venue for private tastings or as a relaxed meeting space during the day time.